Lock in a great price for Holiday Inn Toronto International Airport – rated 8.2 by recent guests! I was only staying at this hotel overnight for an early flight in the morning, but it met my expectations. It offers a free shuttle bus to the airport that runs 24 hours which is so handy. I was able to check in to the hotel, return my hire car to the airport and then get the shuttle back, as well as getting it to the airport in the morning. The bed was comfortable and spacious. The concierge on Saturday was absolutely outstanding in helping me. He was the best I have ever seen and because of him I will definitely book this hotel again. Very good! It was great,nicely decorated and very clean. And the bed was very comfortable! Holiday Inn Toronto International Airport This rating is a reflection of how the property compares to the industry standard when it comes to price, facilities and services available. It's based on a self-evaluation by the property. Use this rating to help choose your stay! One of our top picks in Toronto.Offering a 24-hour airport shuttle, the Holiday Inn Toronto International Airport is just 3 minutes' drive from Toronto Pearson International Airport. The International Center is 2.7 mi away and the Toronto Congress Center is just 1.1 mi away. Each guest room includes free WiFi and a 37" flat-screen cable TV. Tea and coffee-making facilities are also provided. The bathroom contains complimentary toiletries. 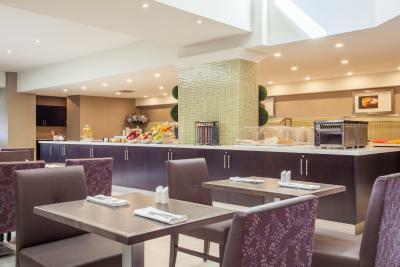 The hotel's on-site restaurant, Bistro YYZ is open for breakfast lunch and dinner. The on-site coffee shop, Seattle's Best is open at 05:00 each day for early morning departures. This hotel features 20,000 sq. ft. of meeting facilities and award winning catering. 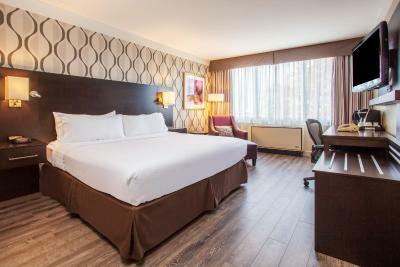 Holiday Inn Toronto International Airport is conveniently located within 5 minutes' drive of highways 401, 427 and 407, offering easy access to nearby attractions including the Woodbine Racetrack (3.1 mi) and Canada's Wonderland (14 mi). Sherway Gardens shopping center is 6.8 mi away. 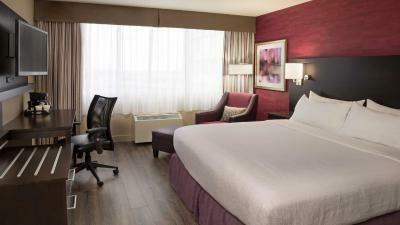 When would you like to stay at Holiday Inn Toronto International Airport? 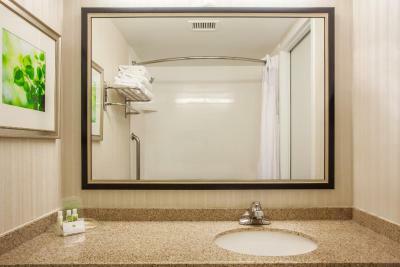 This room offers free WiFi, a 37-inch flat-screen cable TV, a Keurig coffee maker and heated bathroom floors. Private parking is available on site (reservation is not needed) and costs CAD 25 per day. Spacious room that includes a bathrobe, slippers, heated bathroom floors, free WiFi, a 37 inch flat-screen cable TV and a Keurig coffee maker. Free WiFi and a 37" flat-screen cable TV are featured in this room. Keurig tea and coffee-making facilities are provided. An private bathroom features a granite vanity, heated floors and a massage shower. Free WiFi and a 37-inch flat-screen cable TV are offered in this room. Keurig tea and coffee-making facilities are provided. The bathroom has heated floors. A visual alert system, grab bars and hand held shower are also featured. House Rules Holiday Inn Toronto International Airport takes special requests – add in the next step! Holiday Inn Toronto International Airport accepts these cards and reserves the right to temporarily hold an amount prior to arrival. Please inform Holiday Inn Toronto International Airport of your expected arrival time in advance. You can use the Special Requests box when booking, or contact the property directly using the contact details in your confirmation. The wifi was a little spotty, but other than that had no real issues. Difficult to adjust heat.Toilet leaks.hairdryer cover falls off. All cushions ate extremely thick/high for normal head. We could hear every airplane taking off right over our head! Hotel restaurant very expensive! The business centre would not let me open files on my phone, so the manager of the hotel took me to his office and helped me do what I needed with his own computer. He absolutely exceeded my expectations, I will definitely be back! The front desk staff were super pleasant and extremely helpful. Parking is a bit tight. In the past, hadn't noticed how small the bathrooms are ... at least in this particular room. Too tight for 2 people. Have stayed here many times over the years. The location is the next best thing to an actual on-site airport hotel. Access to UP Express is key. The room was hot. We turned the air conditioner on. It was so very loud. It turned on every 45 minutes. Continually woke us up. It was clean and close to where we wanted to eat. Laminate floor in bedroom was functional but made the room feel a bit clinical but this is a high turnover airport hotel so to be expected. Smart, functional, comfortable and just what you'd expect. Brilliant massage in the Spa - they do a 15 or 30 minute relax - great if youve stepped off a plane. Good size pool too. Good facilities elsewhere from what I can see - laundry, restaurant, bar, vending etc. Very convenient to airport. Food in Bistro fine. Overpriced hotel and overpriced food. It’s an airport hotel. It was fine. The incident where my room access was deactivated even though I had one more day stay. A double check could have averted the situation.